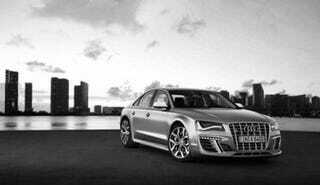 If this is truly a leaked photo of the 2011 Audi S8 — the super hi-po version of the luxobarge Audi A8 — then those German fellas just turned the design up to elf! UPDATE! It's a fake. This photo showed up on The German Car Blog today and has the look of a pretentious Audi press photo. In fact, all it needs is a member of N*SYNC and we'd be sure this is the real thing. Is Justin Timberlake Really The Only Thing Worth Mentioning About a Motor Show? Design-wise the large wheels and aggressive, ABT-style nose is a strong departure from the relatively understated appearance of previous S8's. Could Audi be so bold? We're not convinced. The other big mystery, of course, is what's underneath the hood. We've heard the RS6 twin-turbo V10 putting down around 600 HP. UPDATE: It looks like our skepticism was well-founded. This is but a 'chop put together by someone over at World Car Fans. Thanks to porschecarreragtmay6 for digging it up.